Ben Douek holds prototypes of his Eve board. A computer model developed by software engineering student Ben Douek could help undergrads learn the basics of programming. The device has shown such educational and commercial promise that Douek was selected by U of G’s Hub Incubator Program to receive entrepreneurial funding and mentorship. 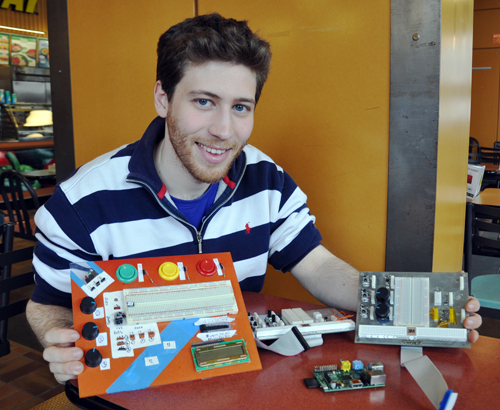 Prof. Judi McCuaig, School of Computer Science, approached him about developing a computer attachment board that first-year students could use in introductory hardware labs for the Raspberry Pi program, launched at U of G in September 2013. Students would need to learn how to write code to perform simple functions, such as turning a light on and off. Developed in the U.K., Raspberry Pi is a tiny computer board about the size of a deck of cards. It has connections for HDMI, Ethernet, USB ports and audio. Another connection is called a general purpose input/output, which allows it to be connected to other electronic parts such as buttons, knobs or switches. The computer’s hard drive consists of a micro SD card. “You can put an operating system on it and have a full computer for $45,” says Douek. Its affordability, he adds, makes it particularly attractive to students because it costs less than some textbooks. Raspberry Pi is so versatile anyone can use it whether they use a Mac or PC. “This gives everybody the same platform.” It also comes equipped with the software students need for an introductory programming course. McCuaig suggested that he apply to the Hub Incubator Program, run by the Co-operators Centre for Business and Social Entrepreneurship. He applied for a chance to pitch his idea to a panel of judges — much like the TV show Dragon’s Den — and was among five teams selected to receive business mentorship and $8,000 in start-up funding. Douek says he benefits not only from the knowledge he receives from local business leaders but also from the other teams that are going through the same entrepreneurial challenges. “It’s cool to network with them and share some experiences,” he says, adding that they also learn from each other’s successes and mistakes. Douek plans to sell the prototype to elementary and high school students who are interested in providing feedback about what they like and don’t like about it. “I wish I had started hobby electronics earlier,” he says. “I want to give people a chance to start electronics earlier and have a better foundation than I did.” He will graduate in June with a bachelor of computer science in software engineering.